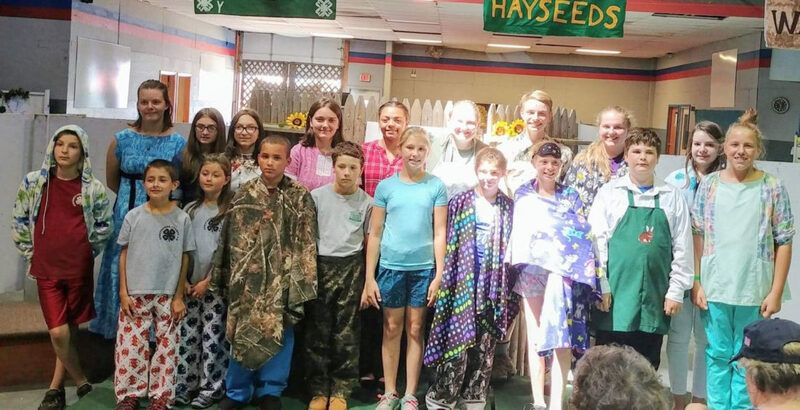 Submitted Photo 4-Hers participated in a Fashion Revue in the 4-H Youth Building at the Chautauqua County Fair. They were able to model the clothing items that they made in the 2017-2018 4-H year. Cornell Cooperative Extension of Chautauqua members have a variety of projects on display in the 4-H Building. The 4-H building is a showcase of the projects created by talented 4-H members, these items are on display all week. The 4-H Building was very busy Tuesday as county fair goers had a chance to enjoy a number of youth and adult activities. 4-H members listed below also gave public presentations in the 4-H Building from 11 a.m. to 12 p.m. on a variety of topics. Jacob Allen Sherman Kountry Kids 4-H Club, Rachel Comstock, Country Critters 4-H Club, Samuel Comstock Country Critters 4-H Club, Charlotte Couchman, Stockton Panthers 4-H Club, Emily DeGolier, Stockton Panthers 4-H Club, Alexander Southworth, “Stow”-A-Way Kids 4-H Club, Natalie Turecek Stockton Panthers, Gabrielle Koszewski, Summerdale Sunset Riders 4-H Club, and Isabella Reuther, Stockton Panthers 4-H Club presented Tuesday.. All received Blue Ribbons today for their excellent presentations. 4-H youth Clothing and Textiles Project members took the opportunity today to show-off their latest creations in the 4-H Youth Fashion Revue and Mannequin Modeling display. Tuesday’s Fashion Revue Participants: Mikael Anderson, Rachel Comstock, Samuel Comstock, Anna Cook, Josh Cook, Charlotte Couchman, Madison DeGolier, Emily DeGolier, Jared Dorman, Mackenzy Graziano, Maci Harmon, Kaylee Hodge, Mikail Lawrence, Jaidyn Newhouse, Isabella Reuther, Deona Sanders, Alexander Southworth, Amelia Sprague, Josiah Sprague, and Natalie Turecek. Commentators provided a brief description of each 4-H member’s age, experience, club and clothing items. Several sewers also offered a Mannequin Modeling show before the Fashion Revue, in the 4-H Building. They were Rachel Comstock, Samuel Comstock Charlotte Couchman, Madison DeGolier, Jared Dorman, Mackenzy Graziano, Maci Harmon, Mikail Larence, Jaidyn Newhouse, Isabella Reuther, Amelia Sprague, and Natalie Turecek. Congratulations to all the winners so far at the Chautauqua County Fair! Good luck to you and everyone else for the rest of the week! Keep smiling!